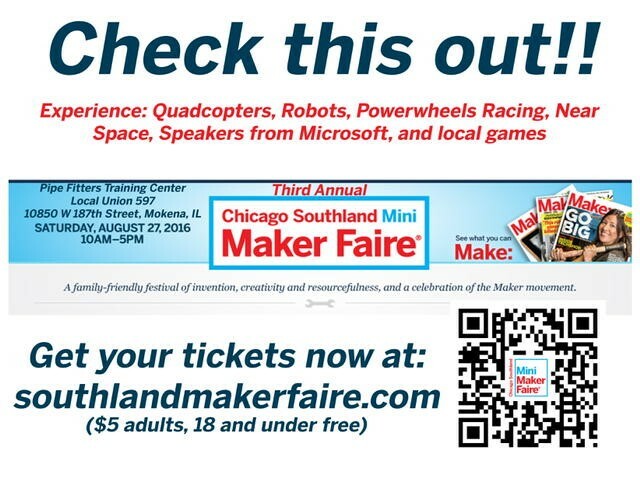 I’ll be working at the Microsoft booth at the August 27, 2016 Maker Faire in Mokena! I’ll be showing off my Raspberry Pi gizmo. Since I last blogged about it, I’ve added a relay and have control of one of the two motors working. The other relay is due to arrive in the mail this week. I also am close to having it pull vote counts from my voting site, http://bit.ly/PiVote, a site I created with an application platform called OutSystems. The voting site exposes a REST web service that reports the vote counts. I recently added a REST web service so it could collect votes, but I haven’t added code to the UWP app on the Pi to use those. I also started thinking about a UX redesign, where the UX would be separated into three parts: Config, Test, and Vote. Come see me at the Maker Faire and I will tell you all about it! This entry was posted in Internet of Things (IoT), Public Speaking, Windows Devices and tagged IoT, PSC, Windows 10 IoT Core by Michael Blumenthal. Bookmark the permalink. ← Previous Previous post: Avoid Defective SD Cards! Test your cards as soon as you buy them. Here’s how!